The SeeYouInIsrael dating process is created to make meeting your match as simple, quick and enjoyable as possible. 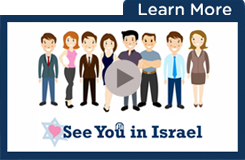 SeeYouInIsrael uses the already successful JMatchMaking technology, through which thousands of Jewish singles from different ages, backgrounds & locations have found their match. The SeeYouInIsrael matchmakers are ready to search, select & send you quality Aliyah-mindedmatches. They ensure you have an easy & efficient dating experience. Our matchmakers get to know you & your dating criteria, & give advice throughout. SeeYouInIsrael's unique Jewish matchmaking process has help many ALiyah-minded and Israeli singles find their match. Jewish singles of different ages and religious backgrounds have had success using the personalized touch of the SeeYouInIsrael system. SeeYouInIsrael was set up as a perfect match between SawYouAtSinani & Nefesh B'Nefesh. SeeYouInIsrael used SawYouAtsinai's unique match technology and adapts it to the ncriteria of the Aliyah-minded community. Nefesh B'Nefesh hopes this initiative will encourage more couples will move to Israel and create families in The HolyLand.